Remember in the original Willy Wonka and the Chocolate Factory movie where they had Smell-O-Vision TV where you could smell what you saw. Wasn't that just the most fun idea ever? Well......Leah and I are having our own version of Smell-O-Vision but this time, you'll get to smell essential oils just like you were sitting here beside me! We have perfected our smell packets to prevent cross contamination so if you attended the class once before and want to do it again, you can!! Our class will be conducted on Zoom which is a video conference call where everyone can see the participants as well as Leah and myself and ask questions real time. 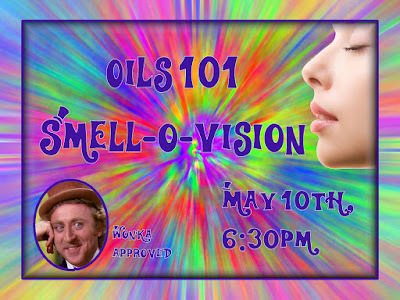 In our Smell-O-Vision class, you'll learn how essential oils can be used for wellness. We've used them to trade out toxic chemicals in our daily routine. It has been our passion for about three years to eliminate chemicals from our homes and we want everyone to be able to have the same freedom and wellness that we have! It doesn't cost anything for you to attend the class or receive the smell samples. The class is on Thursday night, May 10th, at 6:30pm Pacific Time. It will be approximately 60 minutes long. So, tell us you are coming to join the fun and we'll get your smell samples in the mail right away. The last date to give us confirmation is May 5th. That way Mr Postman can get your samples to you in time for the show! The link to the Zoom conference call will be sent via email....it can be viewed on a desktop computer OR your phone! Easy!! 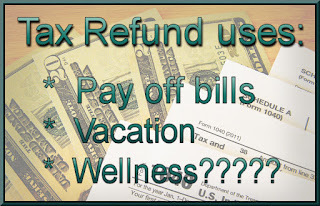 TAX DAY Refund for You! 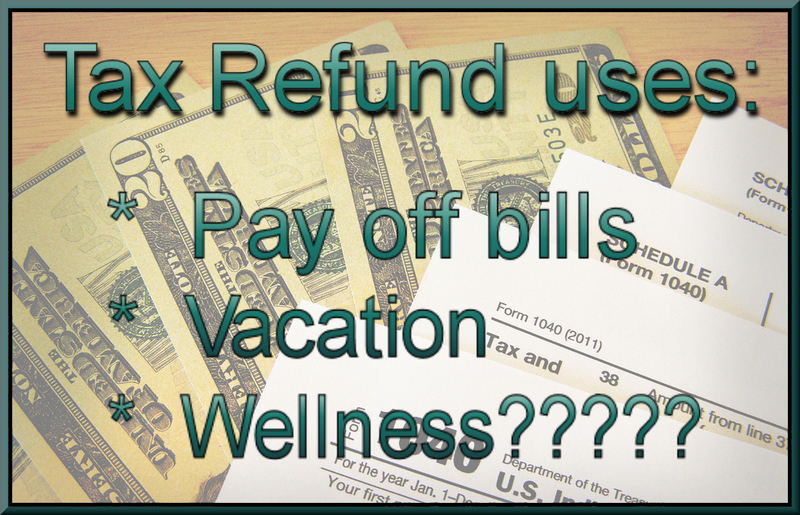 Were you one of those who ended up with a tax refund? We did.....not much but just a little. So, what are you planning to do with yours? I know that many people opt to use it for vacation. Some use it to pay off the bills. Then there are those who decide that their money can be used for wellness! How would you spend your tax money on wellness? Buy a block or series of massages. Start your journey with essential oils for wellness! I think you can see where I'm going, right? Well, today through Wednesday, April 18, 2018 at 9pm PT, your tax dollars will go a little further. I'm giving a little refund of my own to help you start your journey. It is a $25 account credit when you get the Premium Starter Kit (PSK). Woo Hoo!! That is much better than Uncle Sam, isn't it? 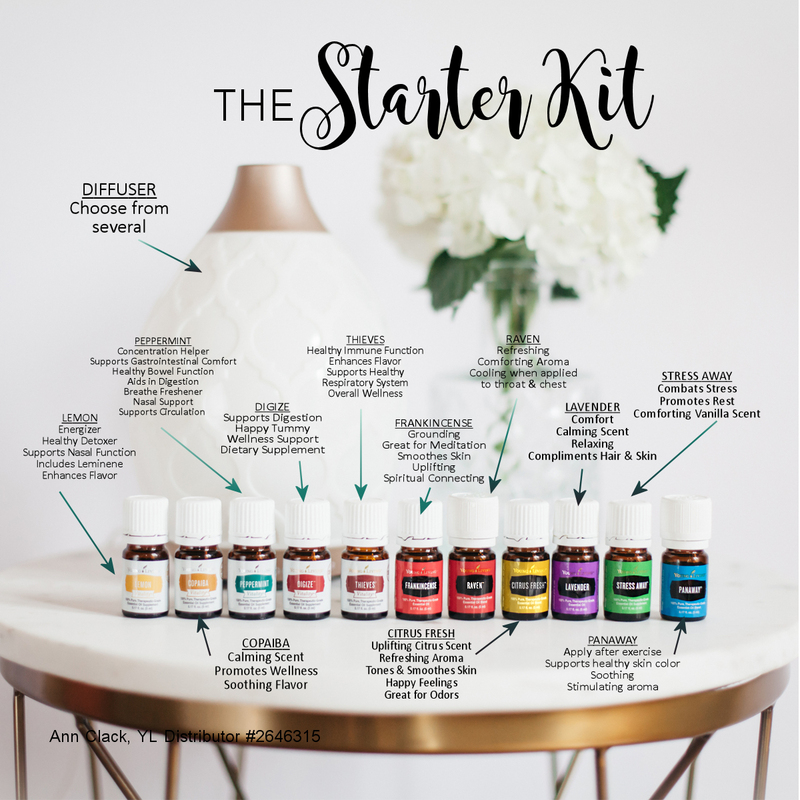 So, let's talk about how the kit can start your wellness journey. The essential oils in the PSK can be used to support all kinds of body systems and create wellness. Check out the graphic below for examples. Don't let 9pm on Wednesday pass by without taking advantage of the refund! You can contact us either here on the blog or on Facebook. Last week we talked about the Dirty Dozen of Cosmetics. I hope you got a chance to read through it and go to your bathroom and check your own stash of products to see if they contained the bad stuff. Well.....today we will talk about the Dirty Dozen of Cleaners. 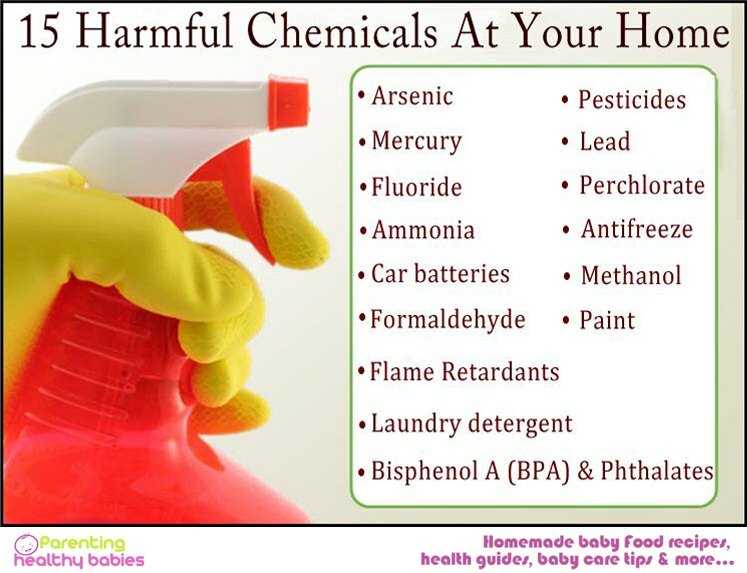 Actually there are WAY more than a dozen Toxic chemicals in your cleaners. You shouldn't have to use protective eyewear, rubber gloves and a mask when you clean. 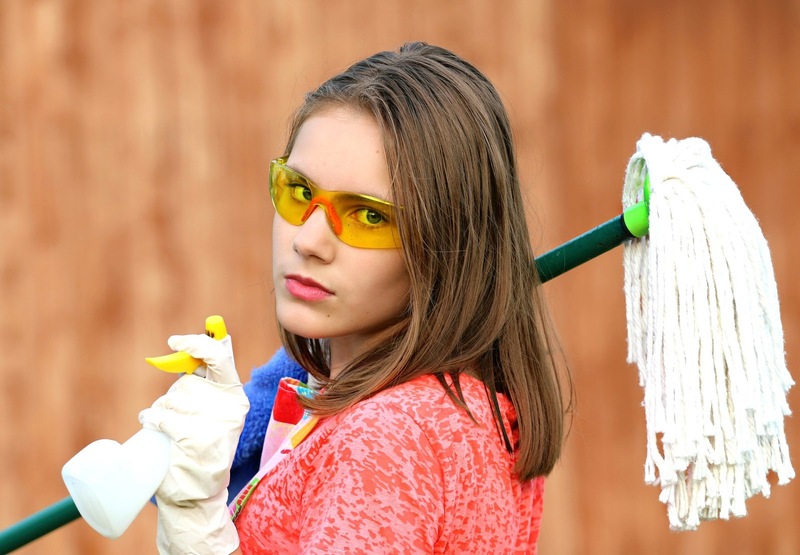 Recently I found the attached article from the Environmental Work Group about some of the worst cleaners you can have in your home. Let me tell you that I was shocked to see some products on the list that I thought we okay!! You can see that list HERE. They call it the Cleaners Hall of Shame. Before we start to talk about the Chemicals in y our cleaners, get on your phone and download the app called Think Dirty. It is has a database that is growing everyday. You can scan the barcode on your products and it will rate it from 1 - 10 on a toxin level. 10 is the worst. You are also able to click on the ingredients of a product and see the individual ratings of each ingredient. Baby Shampoo......rates around a 9!! Dish soaps like Dawn are also rated high. Many times because of the fragrance!! So, in the picture to the left is a starter list for you. 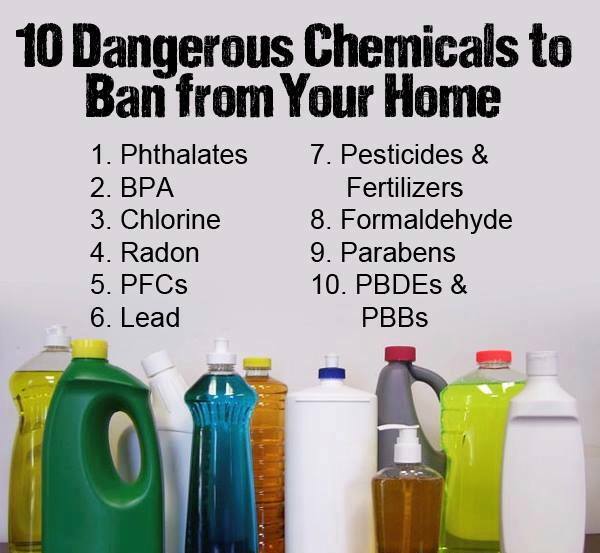 10 Dangerous Chemicals that you really need to BAN from your home! Go to your cupboard and grab the cleaners that you are using. Now here is the most scary part...........look at the picture to the right. If you think the FDA has your back, think again. 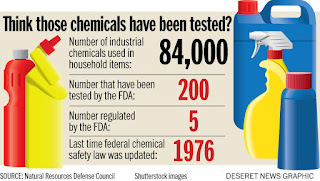 Many of the chemicals that they allow in our cleaning products have been banned in other countries. It makes you wonder why we are in the dark ages. 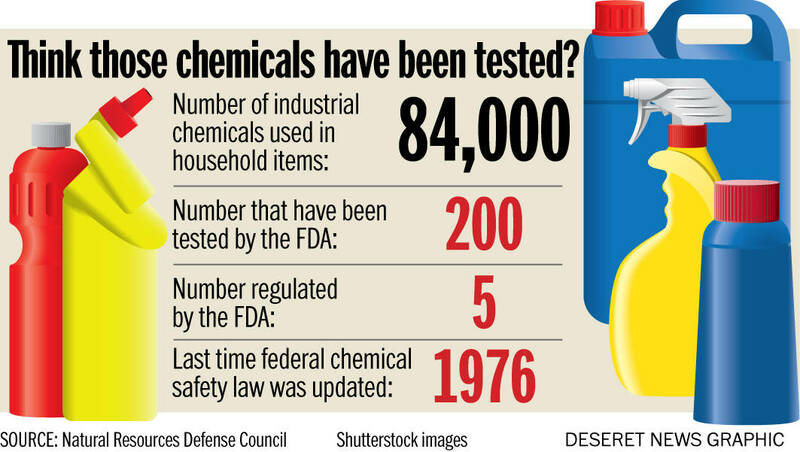 I mean, 1976 was a long time ago and there are thousands of chemicals that have been added to the list since then. Don't think they are working for you, because they are not! If 84,000 sounds like a large number, IT IS!! There were only 10 listed above. Here are another 15! Now you know what I'm going to say next, right? 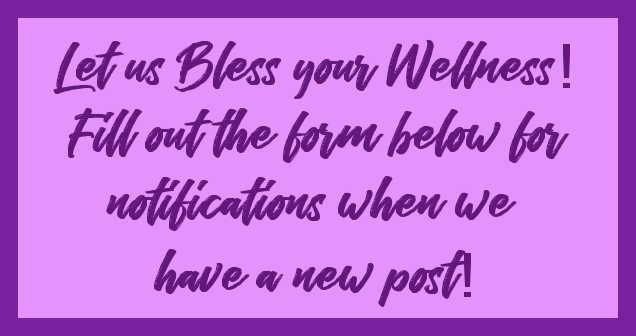 After all, this is a blog that loves essential oils and the products that contain them. This post is no different. If you have been wondering what in the world you can use to clean your home when there are so many chemicals in the products that you always use, think no more. I've banned almost all those products and replaced them with the Thieves cleaning products. The ingredients in Thieves Household Cleaner is all derived from plant based ingredients which makes them more safe for you. I got my first bottle of it and then it sat on my shelf........not to be used for a YEAR. Why? Because I was afraid. Yup.......I thought that dilution chart was too hard to understand (it isn't) and I thought that it wouldn't be nearly as good as the cleaners I was using. I was soooo wrong. If you are on Facebook, there is a cool event group called 30 days of Spring Cleaning with Thieves Cleaner. It doesn't cost you anything to join and there are a lot of ideas of how to use it. Tell me to add you. So.....did you grab a cleaner from under your sink? Did it have toxins in it? Do you feel good cleaning your counters with it and putting food immediately on top of it? If you answered yes to the first two questions and No to the last question then you are ready for a change and Thieves is that change. Don't delay. Tell us today that you are ready to kick the chemicals to the curb. 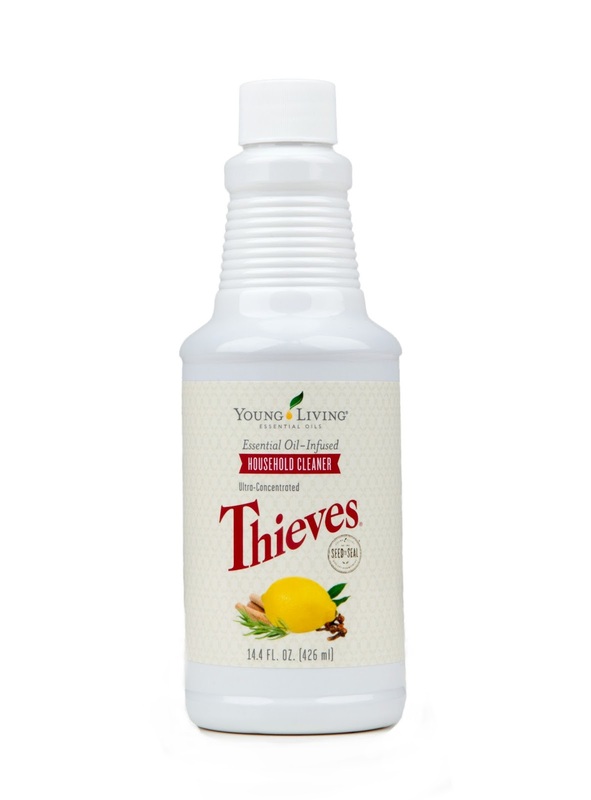 After you have the Thieves Cleaner, you can also look at the Thieves laundry soap, Thieves dish soap, Thieves dishwasher soap, Thieves fruit wash and so much more!! 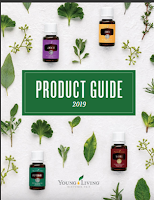 I'm so glad to be connected with a company that not only has a pure and effective product line but one that loves on their members too! How? 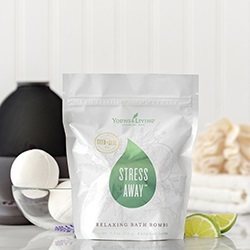 Well, from April 7–14, any new member who enrolls with a Premium Starter Kit and enrolls in Essential Rewards with a minimum 50 PV order (about $50) will get a free pack of Stress Away Relaxing Bath Bombs. That’s sure to make a splash in your day! Months 1 - 3 that you participate you are rewarded 10% of your box point value. The $50 minimum usually has a point value of 50. So, every month your order earns you at least 5PV to spend on YL product!! Month 4 - 24 that reward jumps to 20%. I don't think other reward programs do that, do they? Then to make it even sweeter, at months 3, 6, 9, and 12, you are sent a free oil. Now I KNOW other companies don't do rewards like this!! So, now that you are chomping at the bit to start your collection of wellness, how do you do it? You start by talking with Leah or Ann and tell them you want the Premium Starter Kit. They will help you sign up for the wholesale account. During that process, you sign up for ER (Essential Rewards) with an additional order of about $50 and you're on a great start to creating wellness in your home and body! Make sure you do this by the 14th to get the Stress Away Bath Bombs. AND to sweeten the deal, Leah and I have a few new member bonus items to send you. **Essential Rewards has no contract to sign and you can stop the program anytime you wish. But if you are like me, you'll want to continue. I'm at month 36 and I get 25% back in points on all my ER orders! For the next couple of posts we are going to talk about the Dirty Dozen chemicals in several items we ALL use! I know that as a female, I use lots of skin care products. (yes, I know, guys use them too!) As women, we always seem to be fighting the progression of age and gravity. Right? Many of us use makeup as well. 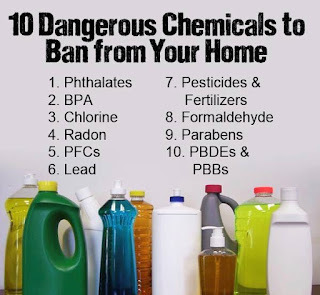 Most all the skin care and makeup products available to you in the big box stores or department stores are FILLED with chemicals from the dirty dozen list below. So, I have a challenge for you. Grab some of your skin care and makeup bottles or boxes and read the ingredients. Compare those ingredients to the list below. Did your products have any of those chemicals in them? If they did, comment below or on my facebook post which ones you found and tell me when you are ready to get rid of them! 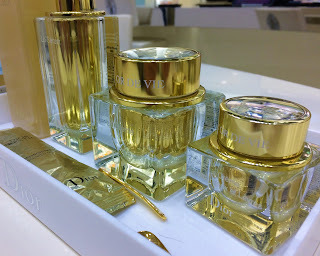 Found in lipsticks and moisturizers, among other types of cosmetics, BHA and BHT are classified as possible carcinogens. Long-term exposure to these ingredients has been linked to liver, thyroid, and kidney problems. On ingredients lists, these will show up as “P-phenylenediamine” or “CI” followed by a number. P-phenylenediamine is a coal tar dye found in hair dyes, while CI (or Color Index) numbers are used to identify coal tar dyes in a variety of pigmented cosmetics like lipstick. Derived from petroleum and composed of many different chemicals, coal tar dyes are recognized as a human carcinogen and have been linked to brain damage. This ingredient helps make cosmetic products creamy or sudsy and can be found in products like facial cleansers, shampoos, soaps and moisturizers. In the short term, DEA can cause moderate skin and eye irritation, while sustained exposure has been linked to liver, skin, and thyroid cancers. Dibutyl phthalate is a plasticizer commonly used to prevent nail polish from becoming brittle. Consistent use of DBP has been linked to hormonal disruptions and developmental defects in fetuses, as well as liver and kidney failure. Look for ingredients like DMDM hydantoin, diazolidinyl urea, imidazolidinyl urea, methenamine, quaternium-15, and sodium hydroxymethylglycinate. 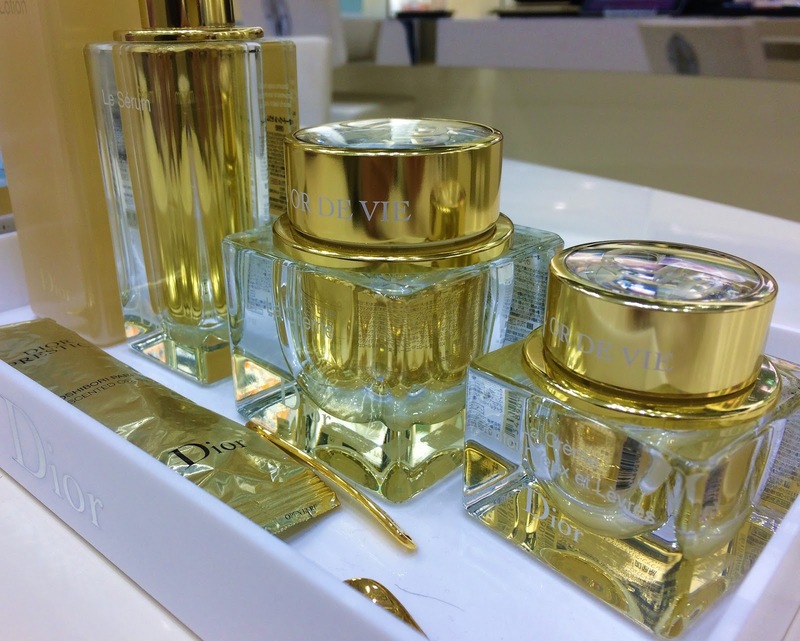 These preservatives are used to increase the shelf life of a variety of cosmetics and they work by continuously releasing small amounts of formaldehyde – a known human carcinogen. An estimated 75-90% of cosmetics contain parabens, making them the most widely used preservative in makeup and skincare products. The ingredient has been linked to hormonal disruptions, breast cancer, increased skin aging, and DNA damage. About 3,000 different ingredients are used in fragrances, though these will show up as one word on ingredient lists – “fragrance” or “parfum”. Used in more than just perfumes, these smell-enhancing substances can be found in almost every type of cosmetic product. Many unlisted ingredients in fragrances have been linked to health problems like asthma, allergies, and even cancer. Common in cream-based cosmetics, PEG compounds are used as thickeners, solvents and moisture-carriers. Depending on how they are manufactured, these ingredients can get contaminated with carcinogenic substances like ethylene oxide and 1,4-dioxane. Even when not contaminated, PEG compounds have been shown to cause skin irritation. Petrolatum is a petroleum jelly that is used in hair products to add shine and in lip balms, lip sticks, and moisturizers as a moisture barrier. The ingredient is often contaminated with PAHs (polycyclic aromatic hydrocarbons), a known carcinogen, and can cause skin irritation and allergies in smaller doses. Look for ingredients ending in “-siloxane” or “-methicone”, which are found most commonly in hair products and deodorants. 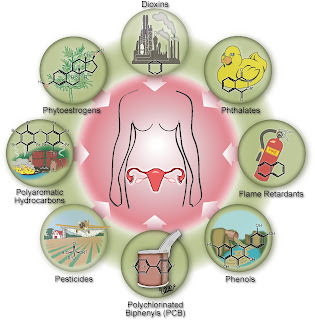 Many of these ingredients have been found to impair fertility and cause hormonal disruptions. This foaming agent can be found in cosmetics like cleansers, bubble bath, and shampoo and toothpaste. 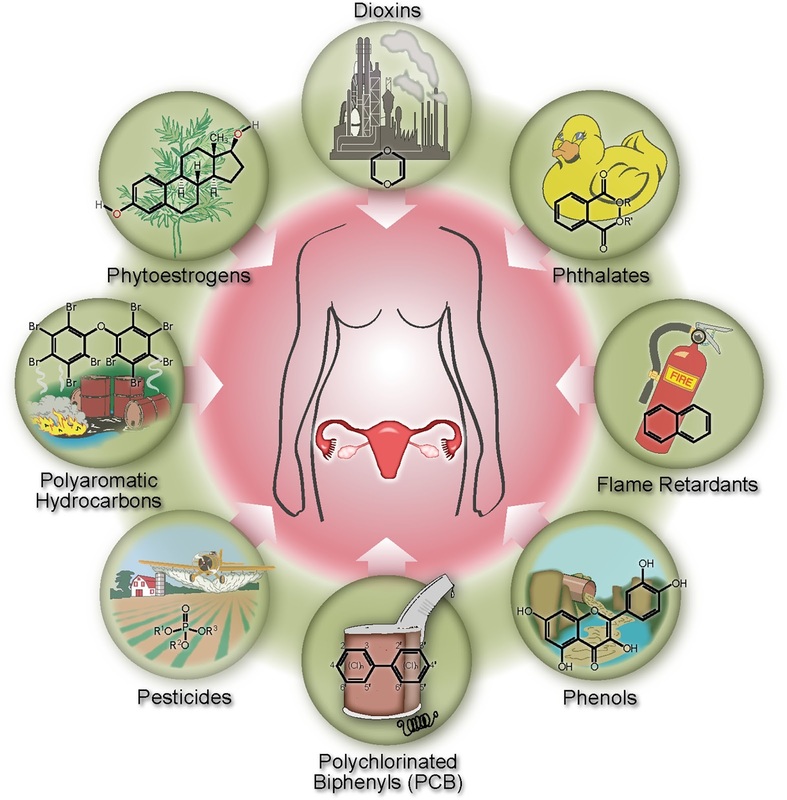 Many commercial varieties are contaminated with ethylene oxide and 1,4-dioxane – known carcinogens. This ingredient is found in antibacterial cosmetics like deodorants, cleansers, and hand sanitizers. The ingredient is said to cause skin and eye irritations in the short run, and conditions like antibiotic resistance and hormonal disruptions with sustained use. Does Young Living have an answer.......yup! They have a full line of skin care products which I use all the time that do not have toxic chemicals. They now have a line of mineral makeup which I love and feel so light on your face you don't even know it is there. So tell us that you are ready to start your chemical free living today! !